Sr. Ayisha Afrik was finishing up her last practice before the OK Red swim and dive conference meet. The training exhausted her after three hours of extensive distance swims, including nine 200s that got faster as they completed each. Her core muscles and quads burned because of all the sprint work and “dry land” exercises they did in the last half hour. 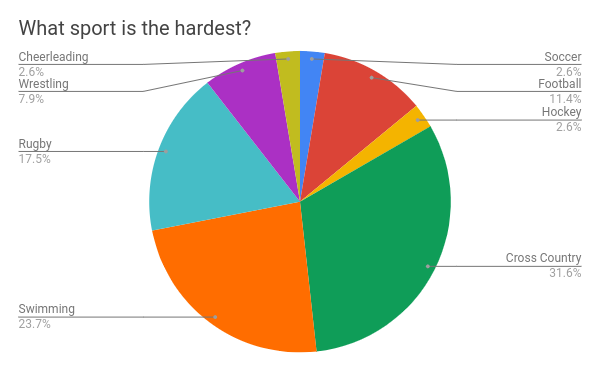 A poll was sent to over 100 students at West Ottawa, asking which sport they thought was the hardest. An overwhelming percentage of the students responded with either cross-country or swimming, cross-country being the most common choice. But Afrik, a 4-year swimmer for the West Ottawa swim team, knows swimming is the most involved and intense sport that West Ottawa offers. In swimming, when Afrik misses a practice, she “usually [goes] to the Holland Aquatic Center on Sunday [to] make up the conditioning time.” For any day that Afrik is not at practice, she spends two-and-a-half hours of her free time to stay on track. Whereas in cross-country, when Sr. Katie Frauenheim misses a practice, she spends about 40 minutes running on her own. The significant difference between the two sports in the amount of make-up work required pays tribute to the rigorous and extensive dedication required to stay on track with the rest of the team. When practice time comes along for Afrik that means for Mondays and Wednesdays, getting up at 5:20 and rushing to school by 5:45 for morning practice and then two to four hours after school every day and Saturdays at 8 a.m.
For Frauenheim, every day after school for about 2 hours she practices, in which she does stretches, 40 minutes of running outside, and core workouts. During the off-season, Afrik conditions and swims for two-and-a-half hours every day to stay in shape. For her off-season workouts, Frauenheim conditions and runs for about one and a half hours, three days a week. Both girls explained how much of their sport is pure self-motivation; the coach isn’t out there with them, providing encouragement or tips during competition. “They push pretty hard but it is self-motivated because the coach can’t make you swim faster so you get out what you put in,” Afrik said. “They push us pretty hard but you also have to push yourself because they aren’t there during the races so you have to push yourself,” Frauenheim said. The self-driven determination given by both girls reflects the effort they both put into their sports. Cross-country and swimming are exceptionally harder and require more dedication than other sports such as football, wrestling, and rugby. However, swimming is by far more rigorous than cross-country.